Something must be in the water down in Albuquerque, New Mexico. Outside of stockpiling wins at unprecedented rates, the famed MMA gym has now produced two of the sport’s baddest cartwheel artists. Clearly, nobody will ever top Diego Sanchez’s patented YES! Cartwheel down a grassy hill. 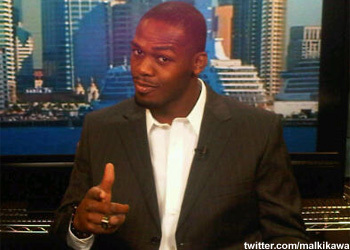 However, budding superstar Jon Jones is practicing his own rendition of the infamous move. Thankfully for “Bones,” Sanchez has given him his blessing to bite his style. He even tutored Jones throughout his brief exhibition. No word if Jones intends on unveiling his ‘YEAH Cartwheel’ should he hand Ryan Bader his first pro blemish at UFC 126. Sanchez, on the other hand, is a wild card and could very well bust out his maneuver during his “UFC on Versus 3” scrap with Martin Kampmann.